Originally published under the title, "The Left has Failed to Confront Islamism"
As the world struggles to understand and cope with the rise of pan-Islamism and international jihadi terrorism within Western countries, one thing is becoming increasingly clear - the success of the Islamists is partly due to what I believe is a grand betrayal of civil society by the political left in Western democracies. Instead of leading the fight against the fanatics' religious obscurantism, they have embraced it. The refusal of social democrats, liberals and leftists to stand up to Islamofascism in the democracies of Europe, North America, India and South Africa, has also had an unintended consequence. It has paved the way for an anti-immigrant backlash against all non-whites, in which the left are portrayed as apologists for religious fanaticism. An unnecessary rise of xenophobia that could have been avoided, had the left led the struggle against Islamofascism, is now entrenched. The success of Islamists is partly due to a grand betrayal of civil society by the political left in Western democracies. 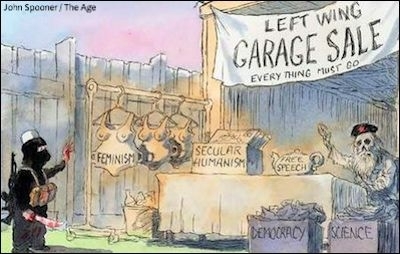 Imagine if Labour in the UK, Democrats in the U.S., the Congress and CPM in India, socialists in France and the left in Canada had not catered to Islamists, but instead drawn a line in the sand on such issues as gender apartheid. Think how different things would be today. Instead we've had more than a decade of appeasement. Last week I sat down with a few surviving friends on the left from the 1960s, who are fortunately in Canada now. "What is wrong with the left today?" we asked ourselves. Millions marched chanting, "Allah O Akbar", "Death to Hindus", "Islam Zindabad" (Long live Islam) as we followed the mobs burning American and Indian flags and, for some reason that escapes me now, attacking the local offices of KLM. In the following weeks I would meet the first influential leftists in my life. They were senior students at my college who distributed leaflets saying "beware of religious fanaticism" and, "We want peace, not war". I was flabbergasted at the thought a Muslim would not want to wage jihad against Islam's enemies and engaged in a heated debate with a med student. What followed was weeks of missed classes, late-night debates under dim streetlights and the opening of a new world to me ­— that of politics. I read Bertrand Russell's Why I am Not a Christian, Maxim Gorky's The Mother and John Reed's Ten Days that Shook the World. It is particularly important to bear in mind: The need for a struggle against the clergy and other influential reactionary and medieval elements in backward countries; … the need to combat Pan-Islamism and similar trends, which strive to combine the liberation movement against European and American imperialism with an attempt to strengthen the positions of the khans, landowners, mullahs, etc. I detest what communism ended up doing, but Lenin's wisdom on this point left an imprint on this Muslim's mind forever. The left's betrayal will not be forgotten.